The Blue Water River Walk is almost one-mile of St. Clair River shoreline immediately south of the mouth of the Black River in Port Huron, Michigan. It is less than a mile downriver from the Blue Water Bridge to Sarnia and the southern end of Lake Huron. Owned by the Community Foundation of St. Clair County, the Blue Water River Walk is open to the public year-round. The shoreline used to create this beautiful River Walk was donated to the Community Foundation of St. Clair County by local philanthropist Dr. James C. Acheson at Christmas of 2011. This initial gift, valued at approximately $1.5 million, has now been leveraged to create a total public and private partnership investing more than $10,000,000. What can you find at the River Walk? The River Walk is full of amazing structures, nature and sights. Whether you’re looking for history or to discover why they call it the Blue Water Area, the River Walk can help you find it. 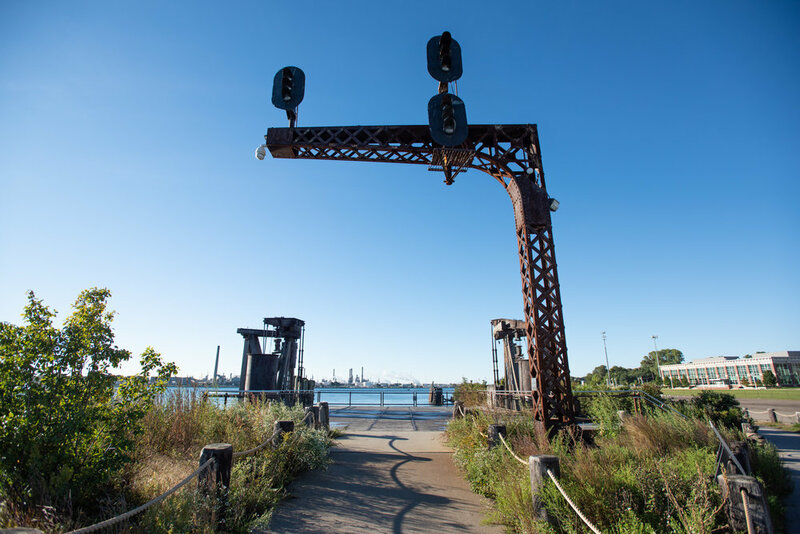 The old railroad ferry dock, which dates back to the early 1900’s, has been fully restored and re-opened to the public. Once used to help transport goods back-and-forth to Sarnia, the Ferry Dock is now a beautiful patio overlooking the St. Clair River. For private rentals of the Ferry Dock see instructions below. One of the many fantastic enhancements of the Blue Water River Walk is public art. Adding public art and artifacts is another way we have been able to embellish our River Walk and make it more interesting for visitors. 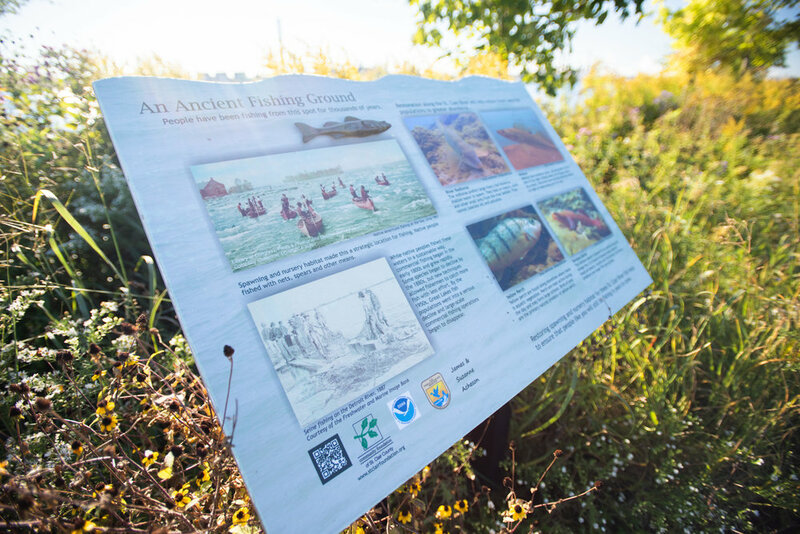 At the north end of the River Walk, just north of the Observation Dock, is our Outdoor Classroom. 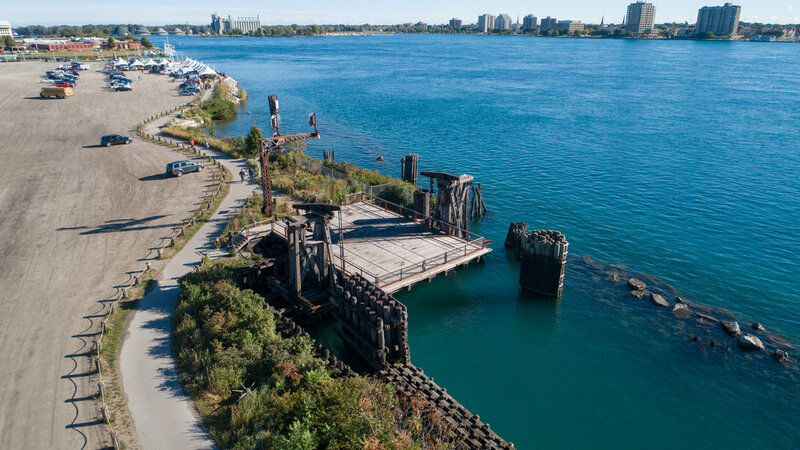 Intended as a true interactive learning environment, the Outdoor Classroom is meant to teach the public about the St. Clair River ecosystem and the plant and wildlife habitat found along the River Walk. River Walk information courtesy of the Community Foundation of St. Clair County.